AKARI (Previously known as ASTRO-F or IRIS - InfraRed Imaging Surveyor) is the second space mission for infrared astronomy in Japan. AKARI was developed by the members of JAXA/ISAS and collaborators. 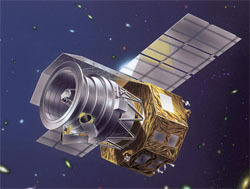 IRAS (Infrared Astronomical Satellite, launched in 1983 by the United Kingdom, the United States, and the Netherlands) carried out the first all-sky survey at infrared wavelengths and made a huge impact on astronomy. The AKARI mission was an ambitious plan to make an all-sky survey with much better sensitivity, spatial resolution and wider wavelength coverage than those of IRAS. AKARI had a 68.5cm telescope cooled down to 6K, and observed in the wavelength range from 1.7 (near-infrared) to 180 (far-infrared) micrometer. AKARI was successfully launched into space by a M-V rocket and it was placed in a sun-synchronous polar orbit at an altitude of approximately 750 km. After carrying out a large numbers of observations, the operation of the AKARI satellite was completed on November 24, 2011.